An Uptown Pilates studio has been allowed to resume construction on its controversial new Magazine Street building even as it continues negotiating with the city over its final design and parking requirements. A packed meeting of the Audubon-Riverside Neighborhood Association attended by city officials and representatives of Romney Pilates led residents upset about the studio’s impact on the neighborhood to conclude that there is little they can do other than strive for better notification about similar projects in the future. The studio owners first took their building plans before the city’s Board of Zoning Adjustments in 2009 for two issues – its position relative to Magazine Street and the amount of parking it would require, according to officials and public documents. City staff members recommended the building be oriented closer to Magaine Street, but with parking along the side to prevent departing customers from having to back onto Magazine. At an August 2009 zoning-board meeting, this concept was approved, along with a waiver allowing the studio to have only four parking spaces instead of the 14 its square footage would require. Construction did not begin until late 2010, and complaints from surprised neighbors quickly followed. 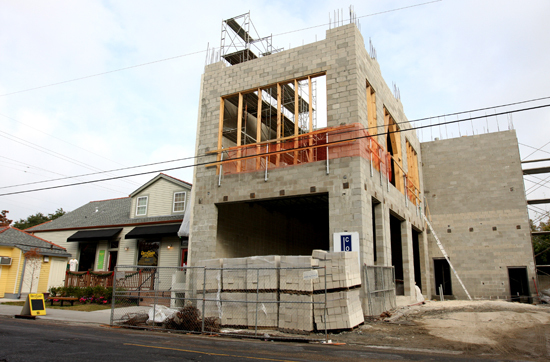 The three-story structure attracted the concern of Mayor Mitch Landrieu last month at about the same time as the rest of the neighborhood began to take notice, said Michael Sherman, who represented Landrieu’s office at the ARNA meeting. “His first comment to himself was, ‘This building just looks out of scope and out of size with everything else around. Can this really be legal?’” Sherman said. That third story has become a flashpoint of sorts, as many critics say it was improperly left out of the original presentation to the zoning board, which includes a drawing of a two-story building. Romney attorney Justin Schmidt said that drawing was merely intended to illustrate the orientation of the building with a parking lot on the side, rather than the appearance of the building itself, but many at the meeting said they felt it misled the board. “There should be very tight requirements as to what is to be submitted,” agreed City Councilwoman Susan Guidry. “If the BZA had seen the building that is now planned, they might have thought differently, given the mass of that building right at the sidewalk. At one point, Guidry called for a show of hands of the 50 or so people crowding the Laurel Street Bakery for the meeting: How many people in the audience came in opposition to the project? More than half the hands in the room were raised. Of those people, Guidry then asked how many were concerned about the design, and how many about parking. To that question, many more hands were raised about the parking issues – though Guidry acknowledged that the pedestrian-friendly atmosphere of Magazine Street prohibits full-sized parking lots around every new business. Still, reducing the number of required parking spaces so drastically from 14 to four was “an ill-advised decision in already stressed neighborhood,” said Sherman, referring to Whole Foods supermarket and the proliferation of other, smaller businesses on the block. In fact, the Landrieu administration was so concerned about it that officials re-measured the Romney building once construction had begun, recalculated the number of parking spaces required, and found it to be 15 – allowing the city to halt construction temporarily during December to re-evaluate. Officials decided that the 10-space waiver from 2009 still applied, however, and could only technically require one additional space on the site, which the building owners found by moving a dumpster. With construction allowed to resume, both the parking and the design issues are being addressed by the studio owners now, Schmidt said. The third “floor” was actually intended only to be a high ceiling in the front, so the owners are now seeking approval from the state fire marshal’s office for a “camelback” design that would significantly reduce the building’s face on Magazine Street. Beyond that change, however, the studio owners do not want to reduce the actual square footage from their current building farther down Magazine – the need for more space was one of the initial reasons for the move, Schmidt said. “The mayor would love to see it reduced as much as possible,” Sherman said of the upper story, acknowledging the studio’s effort. With regard to parking, the studio is attempting to secure agreements with nearby businesses to use their parking after their hours, Schmidt said. With the understanding that the studio’s current actions likely comprise all that can be required to accommodate the neighborhood, residents began asking how they could have been so surprised by this building to begin with. For starters, current law only requires a property owner to notify his immediately-adjacent neighbors of requested changes – not the neighborhood association, Guidry said. In fact, the city in 2009 did suggest that the Romney developers speak to the Audubon-Riverside group. Schmidt produced an email showing that a former ARNA president told the developers that the group couldn’t support a reduction in parking, but that they were not opposed to the project as a whole. The current ARNA board members said they were unaware that any such letter had been sent. The email made the association “look terrible,” said current president Ray Cannata, a notion that other board members agreed with as they tried to dissect how it got sent. “What could we say to anyone at that point?” asked board member Tim Betzbe. Adams said she believes the studio was never formally discussed by the board, but that it had only come up in a passing conversation after a meeting one night, as the past president mentioned that the lot was going to be used for a Pilates studio. The studio’s actual requests were not discussed, and no vote was ever taken, Adams said. ARNA, however, is not the only neighborhood that has expressed concern with the Pilates building; both Hurstville and Upper Hurstville have as well. Schmidt said that when the city directed the developers to talk to ARNA, it never mentioned the other two groups. “If Hurstville and Upper Hurstville didn’t get notice of it because they weren’t on that list, I don’t think that’s something you can hang on Hunter and Erin,” Schmidt said, referring to Hunter Cazes and Erin Romney, the husband-and-wife owners of Romney Pilates. That change is underway, Sherman said, citing both the city’s new Office of Neighborhoods and its nascent Neighborhood Participation Plan. “One debate we’ll hopefully never be having again is, ‘I didn’t get notice of this,’” Sherman said. I am a 67 year old New Orleanian, an Architect, Contractor and Real Estate Broker and I am outraged by the happenings regarding the design, approval and construction of the Romney Pilates Center located at 3701 Magazine St. across from Whole Foods Co.
To begin, this entire area is a parking nightmare. Magazine St. is a narrow two lane street lined with shops and businesses as well as Whole Foods Co. and practically no parking. The lot in question is only 56 x60 feet, and according to the T-P article on same should have had a 20 foot setback and 14 parking spaces. Somehow and this is the part that really gets to me, the City of New Orleans granted a 17 foot reduction in front yard setback and a 10 car reduction in parking! This is insane! How could anyone possibly have granted those exceptions on this small lot in this location! Has no one at City Hall any sense at all, or was City Hall just acting on the orders of persons who had a self interest in seeing this project pushed along? Or was this just another instance of misconduct on the part of the previous administration, whether granted for friendship, money or whatever inane reason, it does not make sense. The City should have seen that every one of the at least five neighborhood associations in the area should have been appraised of this project well in advance and been given full disclosure by the developers of every aspect of their design. Then with proper neighborhood representation at a public hearing, a discussion could have taken place regarding the pro’s and con’s of the developers request that the City grant a 17 foot setback reduction and a 10 car parking reduction as well as the oversized building’s three floor design. Since the above did not take place it is fair to say that this building was not properly permitted. This project should be shut down and the owners required to re-design and re-permit it according to the code requirements of a 20 foot front yard and 14 parking spaces, with no variations from same. Allowing this project to be built and occupied will only add to the already over congested parking situation not just in this immediate block but for many blocks around this area. This is not fair to the many resident neighbors and existing businesses who have to fight the traffic and congested parking every day. It’s time the City of New Orleans forget It’s past way of granting permits and move forward with a fair and just permitting process that allows for the comfort and security of it’s existing neighbors and citizens. I think we need to shine a light on this process and indicate which individuals within the Zoning Commission allowed this project and approved the downsizing of parking from 14 to 4 spaces. As with the fiasco in Dale Atkins office those who are responsible must be held accountable and their action evaluated so such a failure can not happen again. It is amazing how quickly those who bend the rules use those very rules in order to avoid financial consequences. Unfortunately those who have invested in homes and businesses will suffer from reduced property values, inconvenience and reduced business from customers tired of the very difficult traffic situation. These businesses and individuals have no remedy for their losses. Well put Sandy, I agree with every word you wrote. I don’t oppose the Pilates center, and positive rebuilding efforts, I oppose the manner in which they went about this project. They should have played by the rules, period. The deceit is not fair, and is not right. They structure that was there before Romney Pilates was I believe had the same setback from the curb as the building being built has. I do believe Erin went thru all the steps with the city that she was told to do before she started building. You neighbors should be mad at Nagin administration not Erin if something hasnt gone your way. Im sorry but the city approved this project and you should accept it. I do recall all you people in the area had a fit about Whole Food going it and for goodness sakes it was a bus barn before that. Parking on Magazine is a issue from the beginning to the end. I dont think many restaurants, etc on Magazine having parking period. Lets see I look for parking places every place I go on Magazine Street.